I have spoken about this issue before. When the U.S. government had built its border fence, the Tohono O’odham people, who live on both the U.S. and Mexican sides of the border, were against an impenetrable fence dividing their land. They thankfully succeeded in preventing such a fence from being built on their land. And this is the issue. With U.S. President Donald Trump still in one form or another pushing for a border wall, he is not taking into consideration that part of the land where the border wall would go is on the Tohono O’odham people’s land. This land has been theirs even before the Spanish had ever landed in the Americas. For the Tohono O’odham, there is no international boundary—this is their land and the people in what would be Mexico are their people just as is true in the United States. The U.S. government had given them this land in perpetuity over 150 years ago. This means that the land is the Tohono O’odham peoples to do with it what they will. In the language of the Tohono O’odham, there is no word or words for a walled barrier. They have never had a walled barrier to keep people off their lands, and certainly not their own people. The only good news is that the U.S. Congress stood up to Trump on the issue of the border wall, and in the end Trump re-opened the government without getting what he wanted. This is a victory for the Tohono O’odham as it is for many private land owners who no more want a huge border wall than the Tohono O’odham. For the people who own vast tracts of land on the U.S.-Mexico border, it is an issue of privacy. For the Tohono O’odham, it is a question of sovereignty. They are a sovereign nation, and this should be respected. 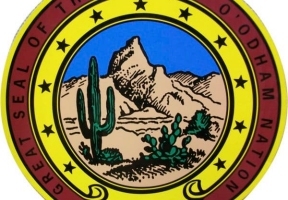 The Tohono O’odham do work with U.S. federal agents to try and stop people trying to illegally cross their lands, and the Tohono O’odham spend $3 million a year for border security. They just do not want Washington, D.C. telling them what they have to do on their own land.